I have frequently been asked about my diet and although strictly speaking I am not vegan, I do follow a plant-based diet, which means no meat, no dairy, no eggs, and no other animal derived ingredients. When cooking we tend to wing it (and by "we" I really mean Jack because he does most of the cooking.) We shop from the local market and mostly stick to what is in season; our diet is full of fresh fruit and vegetables and we always cook from scratch. We tend to take traditional recipes and adapt them into vegan-friendly dishes. There are a few cookbooks nestled on our shelves that have become indispensable and several blogs we both love to read. 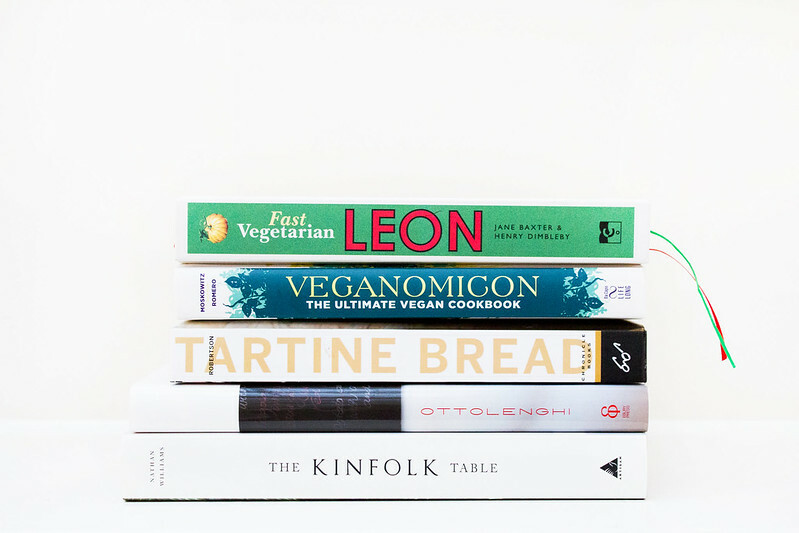 If you were to buy only one cookbook, I would recommend LEON: Fast Vegetarian but all of these are worth owning. I had no idea you were vegan, of the none strict variety, though why would I!! Great veggie/vegan restaurant that really lives up to the hype, terre a terre in Brighton, in case you ever end up that way!! These sound great, I really need to get into cooking more! I've been a vegetarian for the last 2 years. I still don't know how to cook some veggies and fall into a rut. These are great suggestions. Thanks. I don't have The Kinfolk Table, but their magazine is beautiful. When you guys travel, do you allow yourselves to indulge in local foods and treats? I got a question and I hope you don't take this up as rude, but how is your diet different from a vegan diet? I always thought vegans just didn't eat any meat, dairy and animal derived ingredients but I must be missing something, am I not? I love the 'stories' more than the recipes but it's a beautiful looking book. Apparently we didn't buy the best Ottolenghi book, so I think another purchase might be in order..! I believe there is a new one out now or coming soon? Worth checking out! Weirdly enough some people have noticed and questioned me about it - although I certainly don't try to make a big deal out of it. I don't relate to the vegan lifestyle and I never say I'm vegan.. I prefer to have more control over my personal decisions in regards to my diet and lifestyle. Veganism is rather.. restrictive in the way it considers things - so very black and white! Thanks for the tip - I haven't been to Brighton in a while so I might have to head down there soon..
LEON was probably the fast food restaurant you're talking about, it's a pretty good place to grab some quick and healthier option than most places. It's not a rude question at all, Elina. Essentially my diet is identical to a vegan diet, however, veganism is a lifestyle choice that extends further than diet alone. I share a lot of similarities with the vegan lifestyle choices - I don't buy leather, wool, silk, or any other animal product such as natural hair make-up brushes and I try to pick cruelty-free options as far as possible. But I don't identify as a vegan. My diet choices are due to mostly health reasons (I feel ill when I drink/eat dairy products and egg makes me very unwell) but ethics and morals do play a huge role in my decision not to eat or buy animal products. Ugh, I'd love to visit Tartine! I love cooking.. but I think Jack is better at it than me, so I leave it all to him. My mum loves The Hairy Dieters cookbooks! :)) I would highly recommend the LEON cookbooks, they're amazing. Ahhh, I wish I was a better cooker. Jack doesn't have a plant-based diet, he eats anything and everything! :)) My diet stays the same when I travel, although I have occasionally indulged in things that I wouldn't eat at home (although never meat). However, I tend not to do this a lot as I don't eat dairy or eggs because of health reasons rather than ethical or moral reasons (although both play a part) and when I eat dairy or eggs I can be awfully sick, so I try to avoid it as much as possible. Great post. 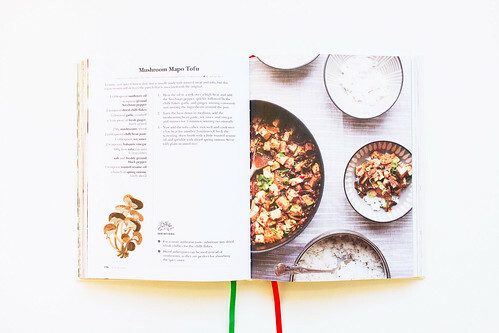 I follow a plant-based diet as well, so it's great to know what cookbooks are good for that kind of lifestyle. Creating with food is something I really enjoy. 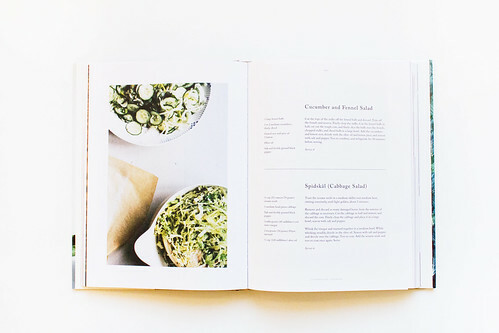 need "the kinfolk table" book!! Thanks for the recommendations. I’ve read a couple of the creative/business books that you’ve reviewed (I’ve read Manage Your Day-to-Day and I’m currently reading Show Your Work!) and I’m a vegetarian so these look good too! Oh, thanks for sharing these beauties! I've been meaning to pick up the Veganomicon forever - everybody raves about it but it's nice to know that you agree! I cook a lot from the Oh She Glows cookbook. It came out relatively recently and I'm not sure if it's available in the UK, but it's the only cookbook I've ever owned and used consistently. We have Leon Fast Vegetarian at work and even though I'm not a vegetarian myself I always find myself having a sneaky look at it (I should really just buy it). I really want to be more experimental with veggies and other foods in general to be honest as I'm in quite a boring rut with them.